I stumbled across Luxulite on Etsy one day and ever since got combarded by tantalising adverts, thanks to Facebook’s cookie system. Gosh and darn it, I had to get me some of the colourful craziness! I am a huge fan of vintage jewellery, especially anything quirky, but with a baby thinking that everything is a chew toy or something to swing on, it is too much of a risk! This stuff is authentic and easy to wear, Betsy loves rattling the necklaces when I wear them, but I know she can’t break them like my old ones! I have to say that the lobster set is my all time favourite! 1. Do you have a love of vintage yourself? I do! I’ve been enjoying the vintage and rockabilly scene for many years now and love attending weekenders and events around the country – my favourite has got to be the Rockabilly Rave, but we are really lucky in the North East as we have a strong community with loads of gigs and events happening regularly around the region. 2.What is your favourite era? In terms of design, music and fashion it has to be the 1950’s, with a little dabble here and there into the 1940’s. There’s a real sense of optimism and playfulness in popular culture and design in the 1950’s which is just too good to resist! 3. What made you start creating retro jewellery? I think it’s a combination of a huge love for the fashion and accessories of the mid 20th Century, and the problem of being able to firstly find it, and secondly afford it! When I started out I was making the jewellery for myself to wear as you just couldn’t get good repro jewellery anywhere at that time – the vintage and rockabilly scenes were saturated with tattoo-inspired plastic jewellery (which is fine but it just wasn’t my bag!) I wanted to wear jewellery that looked like the originals from the 1940’s and 50’s. The more I made, the more friends and family wanted things and it just grew from there! I’d say my favourite piece to date is a novelty corn cob brooch with little brown glass chickens – it was a really fun piece to carve and is lots of fun to wear! It’s usually hard to pin down a best seller as I tend to make quite short, limited runs, but this year my (completely unexpected) best seller has been my Audrey II brooch which was made completely on a whim and was never expected to be such a hit! 5. Do you use anyone as inspiration? The work of jewellery designer Martha Sleeper is a constant source of inspiration, but I also love to look at novelty prints and designs from the mid-century period – there are so many amazing (and some utterly insane) themes in fabric prints, it really is a treasure trove of inspiration. Ideas have come from all sorts of sources though, from films, places or songs, to something as simple as stumbling across an old board game in a charity shop and re-purposing the pieces to make jewellery. 6. Have you got new styles on the horizon? I’m currently finishing off my samples for my Halloween and Christmas collections which is so much fun! I love a good old OTT tacky holiday, and Halloween has got to be my favourite! There’s also a really exciting new collaboration coming up in August with a fellow British designer, so I can’t wait to show everyone what we’ve been working on – watch this space! I for one cannot wait to see the Halloween and festive collection! You must check out Katy’s shop for yourself. The brooches look fantastic on coats, jackets or blouses, so if you are looking for something to finish off the outfit or add a splash of colour on a grey day then this is your best place! They are also really affordable pieces of jewellery. You are looking at £8.50 to £16 for a brooch and up to £25.50 for some of the more crazy necklaces, so nothing that will break the bank and they make awesome stocking stuffers too! Posted in Fashion and Shopping and tagged 50's jewellery, 50's jewelry, katy crebbin, luxulite, plastic jewellery, plastic jewelry, retro jewellery, retro jewelry, vintage jewellery, vintage jewelry. Bookmark the permalink. Apologies for posting these so late, it has been rather hectic and trying to get onto the computer when you have a baby running around is impossible! Well this fantastic show was held in a park. 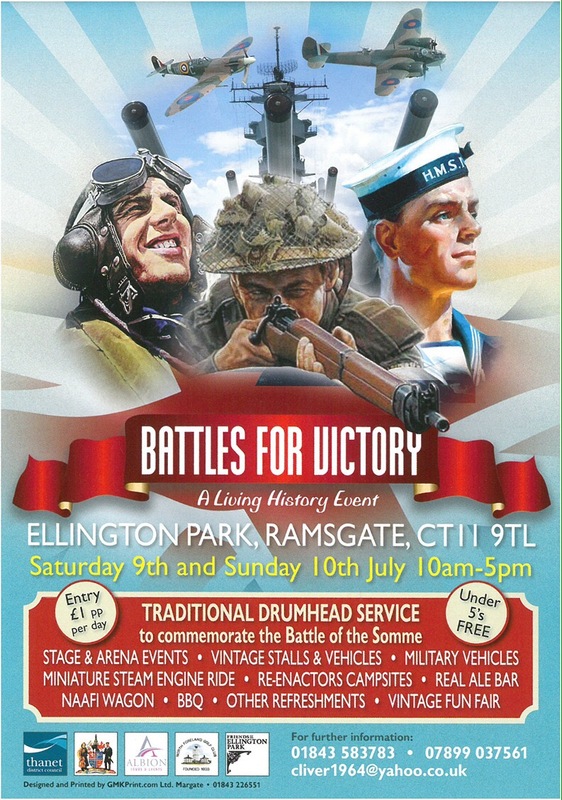 A beautiful setting with a large main stage, vintage vehicles, trade stalls, reenactors and some super eateries. I was also lucky enough to be invited aboard the P22 gunner boat, moored at Ramsgate Harbour. It had just come back from France after being used in the new Brad Pitt war film! It was wonderful meeting up with some familiar faces and meeting new ones alike. This really is a show that will go from strength to strength as it gets bigger. It is just a shame that there were hardly any posters around, or advertisement for the evening Blitz Ball as Im sure there were some people who missed this that would have loved to come! Kitten and the lovely crew! Our hotel…Noisy but full of character! The ever gorgeous Mr and Mrs Brown! Posted in Events and Performances and tagged battle for victory, betsy von mew, kitten von mew, military events, ramsgate events. ww2 events, richard von mew, swingtime sweethearts, viv the spiv. Bookmark the permalink. Battles For Victory this Weekend! I cannot wait to perform at this event! I will be doing a burlesque dance at the Saturday evening Dance to Victory and then a singing set on Sunday at the main event. Viv the Spiv, Swingtime Sweethearts and many more well known entertainers will be there! Posted in Events and Performances and tagged 40's singer, battles for victory, dance to victory, kitten von mee, ramsgate events, ww2 burlesque, ww2 event, wwii event. Bookmark the permalink.